Welcome to one of the finest estates in Mexico. This coupling of villas is located in the world-class residential community of Puerto Aventuras. Known for their award-winning architecture and beautiful Caribbean ocean views, this is the perfect place to relax in a hammock under the lush palm trees that surround the 2 swimming pools. 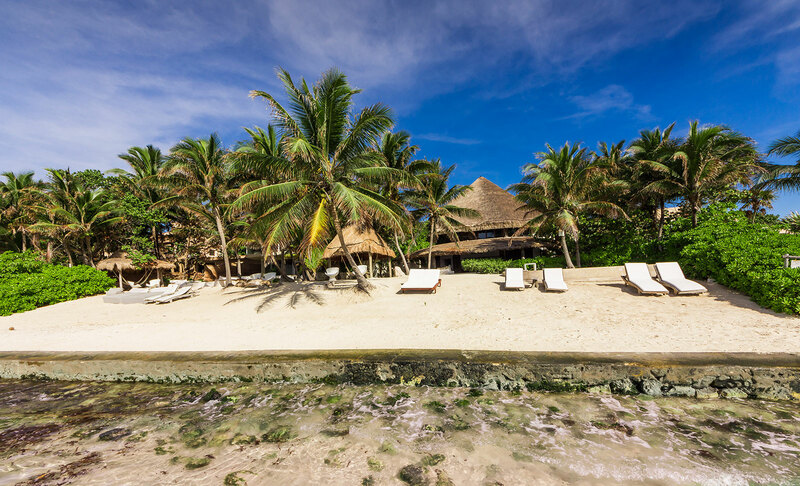 Originally 2 separate villas, Casa del Agua and Zacil Na have been combined to cater for larger groups. No need to worry about organizing a trip to town for dinner, just let the on-site chef cater to your taste and serve you at leisure. Or perhaps the barman can shake up some sunset cocktails. Puerto Estate’s staff will cater to your every need. The only difficult choice will be where to relax, be it the incredible 3-way infinity pool or settling in to the big round sofas on the terrace. Either way you will always be able to enjoy stunning views over the turquoise waters. Located just 45 minutes south of Cancun’s international airport and in the heart of the Yucatan’s majestic archaeological sites and natural parks. Just 5 minutes walking distance to the village of Puerto Aventuras and its world-class marina. Puerto Estate is secluded, yet is ideal for those who enjoy golf, deep-sea fishing, scuba diving, fitness activities, and shopping conveniently within one resort. A few more nearby sites of interest include Playa del Carmen, Tulum, Xcaret, and Cozumel. **Please note that although the beach at Puerto Estate is sandy, the entrance to the water is rocky. Guests are provided “water shoes” for water access. Many parts of the bay in front of Puerto Estate are ideal for swimming and snorkeling, perfect for reflecting on the ocean. If you want to rent either of the villas separately. Please follow the appropriate link to Casa del Agua or Zacil Na.